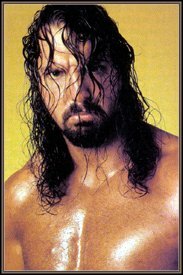 Chris Kanyon claims he was let go by WWE two years ago because he was gay. Others, including a 16-time world champion and the current WWE champ, say that’s simply not the case and that the wrestler didn’t have what it takes to make it in today’s version of sports entertainment. Regardless, says Kanyon, he’d like another shot in the wrestling business. Kanyon, who publicly revealed he is gay earlier this year, recently related his story to about 200 Northern Kentucky University students as part of National Coming Out Day in which groups across the country garner support for gays, lesbians, bisexuals and transgender people. Kanyon told the group that it took years to bring him to the point of revealing that he was gay. He says he also tried to overdose on sleeping pills but didn’t take enough. “I thought, ‘What the hell have you done to yourself? '” he said. The 36-year-old Queens, N.Y., native, who holds a bachelor’s degree in physical therapy from the University of Buffalo and once worked as a physical therapist in the Columbia area, broke into the wrestling business in the early ’90s after being trained by The Fabulous Moolah and Afa The Wild Samoan. Kanyon, who enjoyed a measure of success in WCW during the late ’90s as the hooded Mortis and in 2000 during a feud with Diamond Dallas Page, was released by WWE in February 2004 after a year of not being used in any major storylines and a series of injuries. According to Kanyon, he had informed officials in Ohio Valley Wrestling that he was gay, and shortly thereafter was told to dress like Boy George in a skit with The Undertaker, before being fired. He claims he fell out of favor because the company knew he was gay. He officially “retired” from pro wrestling on Aug. 28, 2004, after losing a retirement match to Page in Wayne, N.J., but returned to the independent circuit a year later. Kanyon, who earlier this year announced that he was tired of “living in the closet” and went public with his sexual orientation, recently made headlines by making an unscheduled appearance at a WWE house show in Daytona Beach, Fla., where he went to the front row during a DX match and held a sign that said “Ask Vince why he fired me” and another that was directed at Shawn Michaels that read “Pray for my gay soul.” He eventually was escorted out of the building by security. Kanyon has been posting on a number of Web sites, including that of WWE broadcaster Jim Ross, whom he sharply criticized. WWE officials have not responded to the allegations, but have remained firm that Kanyon was let go because his contract had ended and his character had run its course. John Cena, in a recent appearance on the Howard Stern show, backed WWE, saying he knew Kanyon well and that he wasn’t good enough to stick in WWE. The WWE champ said it was Kanyon’s inability to entertain that got him fired and not because he was gay, since he didn’t even come out of the closet until he left the company. Cena added that Kanyon lacked charisma and didn’t possess the qualities necessary to shine in the company. Kanyon, a frequent guest on the Stern show, also received a surprise call from Ric Flair during his latest appearance. Flair addressed Stern’s remark that WWE was furious over Kanyon’s claims on the show that he was fired because he is gay. Flair called the show to discredit Kanyon’s claims, saying that Kanyon was not fired for his sexuality, but instead for his shortcomings as a performer. Flair, agreeing with the earlier remarks made by Cena, said Kanyon had in-ring skills, but added that it takes more than mat skills to make it in WWE. Kanyon told Stern’s audience to take what both Flair and Cena said with a grain of salt because they were just saying what McMahon wanted them to say. Flair attributed Kanyon’s early run in WWE to being “Page’s stooge,” referring to Diamond Dallas Page, who had taken Kanyon under his wing in WCW in the late ’90s. Kanyon also said Flair’s comments didn’t make him lose respect for the 16-time world champ, saying McMahon should have made the call himself. “That is why I have not lost any respect for Ric, or John Cena, for that matter. They are both still working for Vince. They both have their bills to pay. And in my opinion, they both said what they feel Vince wanted them to say. And even if that is not the case, if they really believe what they said about me, they are both entitled to their opinion, and I respect that and I respect them. – WWE returns to the North Charleston Coliseum on Dec. 4 with a nationally televised Monday Night Raw along with an ECW taping on the same bill. Both brand shows will air back-to-back beginning at 7:30 p.m.
Tickets go on sale at 10 a.m. Nov. 4 at the Coliseum box office. Ticket prices are $41, $31, $26 and $21 (plus applicable fees). Tickets will be available at the Coliseum box office, all Ticketmaster outlets (including select Publix grocery stores), online at ticketmaster.com or charge at 554-6060. – The main event for this week’s Smackdown, which will be taped today in Milwaukee in order to avoid a Halloween night show on Tuesday, will be Undertaker and Kane reuniting against Mr. Kennedy and MVP. Last week’s Raw drew a 3.6 cable TV rating. The show’s average rating has dropped 10 percent from a 4.0 to a 3.6 since the debut of NFL Monday Night Football on ESPN. More viewers watched Monday’s Cowboys-Giants game than any television show in the history of cable TV.